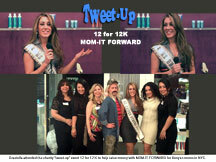 Click here to read Graziella's tweets for one year as Ms United States. 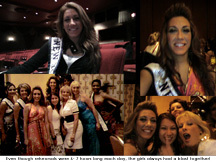 Graziella's final week as Ms United States 2008- 2009. 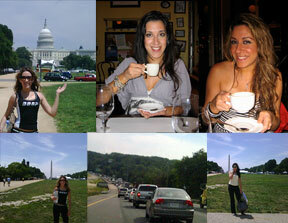 Although she reigned officially for only one year, she will always be Ms United States 2008. Ms United States and sister Miss New York, Liana Baratta embark on a their mini tour to Washington DC & RIchmond Virginia. The sister queens visit the Walter Reed Army Medical Center, visit with designer Michael Taylor in Richmond, and take in the sights of the nation's capital. Visit to Saratoga Springs Elementary School and Middle School to present her B.Youneekly Balanced workshop and do some reading with the first- graders. 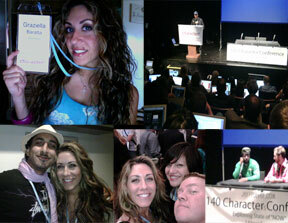 Graziella was a "character" at the very first 140 Character Conference on New York City. Graziella, known as @MsUnitedStates and @GraziellaB on Twitter, was able to meet friends she has tweeted and networked with for over a year in person. Photo Shoot with Angel Sanzhez featuring Tamara Pogosian designs. 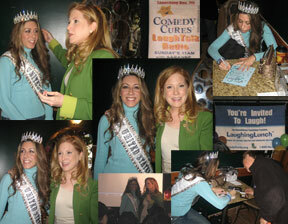 Ms United States goes on a mini- tour to Virginia for a number of appearances. Upon arrival, Graziella was interviewed by Annie Tobey of V Magazine for Women. Next, Graziella visited with designer Michael Taylor in Richmond, who is designing her walk- away gown for the 2009 pageant, then followed by a mini- photo shoot by Corey Daniels. 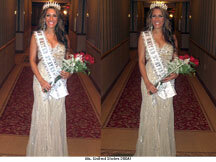 Ms United States was also treated to a beautiful stay at the Wintergreen Resort where she was an honored guest at the concert of Jonell Mosser, and had the honor of interviewing her. 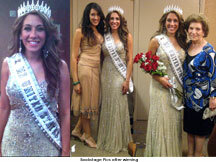 Graziella & her sister queen Brittany Wilians made a dual appearance at the Virginia National Teenager Pageant. 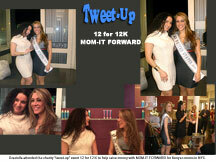 Graziella attended the Mom It Forward The 12 for 12K for Kenya Fundraiser in Soho, New York with fellow "Twitterers." 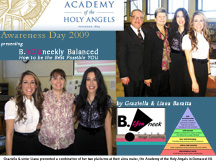 Graziella and sister Liana made an appearance at their alma mater, the Academy of the Holy Angels in Demarest, NJ to present B.YOUneekly Balanced, a workshop for teens on how to be their best possible selves based on Maslow's Hierarchy of Needs. Ms United States and Miss New York, Graziella's sister Liana appeared at McArthur High School in Long Island, presenting B.Youneekly Balanced, a 45 minute interactive presentation on Healthy Habits for Life and I am For Women. Feb 22- 28 Graziella meets with Gary Vaynerchuk internet TV celebrity and social media guru to get some sound career and personal- branding advice. 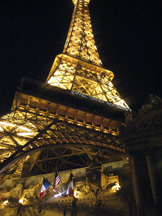 Read the post on her trip. Graziella begins to get involved with multiple projects including expanding her internet TV shows Graziella TV and Pageant Chat TV. Graziella also became a part of The Digital Collective, a web TV project that will be launched very soon! Graziella attended Digital Moda by the Style Coalition during New York City's Fashion Week. Graziella did some microblogging on Twitter during the Digital Moda event and got some insider views on 2009's upcoming fashion trends. Graziella spent a busy January choreographing & editing music for all the dance classes she teaches, filming new episodes of Graziella TV, and new episodes of Pageant Chat TV, where she regularly covers her platform messages: "Healthy Habits for Life" and "I Am For Women." Graziella attended the Q-Scan Annual Banquet along with G-Volution (her dance company) who performed three numbers for the event. Ms United States had an impromptu New York City photo shoot with her sister- queens, Miss United States 2008 Brittany Williams (visiting from Las Vegas) and Miss New York US 2009 Liana Baratta. 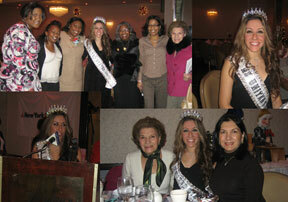 Graziella judges the PA Celebrity Pageant in Carlisle Pennsylvania along with sister Liana Baratta, the new Miss New York US 2009. Read the blogpost about this appearance. 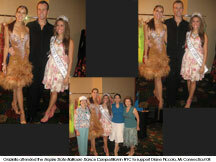 Ms United States represents OSX Fitness Center at their open- house event in Newport, Delaware. Graziella is featured in the Supermodels Unlimited Magazine "Most Beautiful Edition- Power Women" along side 21 other celebrities including Daisy Fuentes, Kristen Haglund the current Miss America, former Miss USA Shandi Finnessy, Giuliana Rancic E- News host, former Miss USA Chelsea Cooley and Haylee Duff just to name a few... Magazine is on stands now through December. 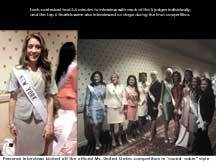 Graziella appears in Pageantry Magazine for a dreamy 3- page recap of the Ms United States Pageant. Magazine is on stands now until end of Winter 2009. 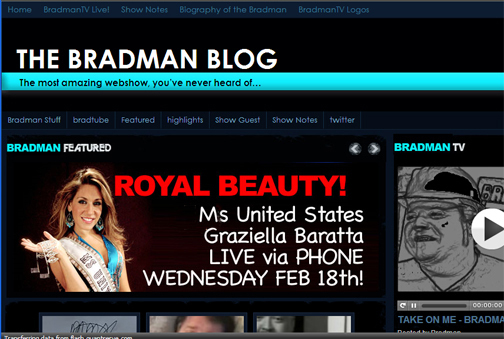 Graziella was interviewed on the national radio show, Pageant Talk Radio by Valerie Hays! Go to the Radio station page to listen to the archived episode -or- Listen to Graziella's interview here. 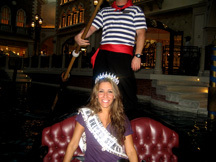 Graziella spoke briefly about her winning moment and about Pageant Palace, the very first pageant networking site. Graziella was photographed by Kevin Michael Reed for Supermodels Unlimited Magazine, for the November issue... See November 12th above for the outcome. 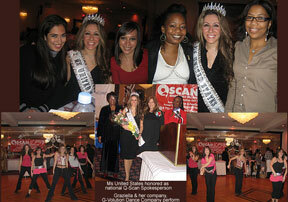 Ms United States is the celebrity spokesperson for Q-Scan (The Queens Sickle Cell Anemia Network). Graziella participated in the Q-Scan Walk-a-thon and spoke on behalf of the organization in Queens, New York. Graziella met with national sponsor Lia Sophia's regional unit in New Jersey, where she was presented with a beautiful gift! 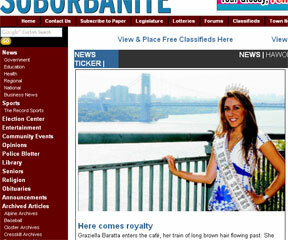 Graziella was interviewed by the Northern Valley Suburbanite reporter, Sophia Gonzalez, and later photographed by John Camporeale for a feature story in the Suburbanite Newspaper. For an alternate view, click here for an alternate view of the article. After a thoughtful creation process, Graziella introduced two new networks to the world wide web: Pageant Palace for the pageant industry, and Dance New York for "everything dance" in New York. Graziella was interviewed and featured on the girls' health.gov website regarding her platforms "Healthy Habits For Life," and "I aM for Women." Graziella creates a network for women B.YOUneek, a network based on beauty, fashion, fitness & wellness just for women, which correlates with her platform "I aM for Women." Graziella attended the Empire State Dancesport Championships at the Crowne Plaza in New York City to support her friend, and fellow pageant sister, Ms Connecticut- Diane Piccolo. Graziella was surprised with a warm homecoming party, followed by an interview with New York News 1 the next day! 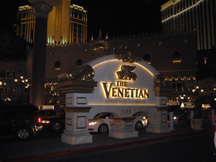 Graziella took some time to see the sights of Las Vegas, and then traveled down the Nevada/ California coastline to arrive in Los Angeles for a little vacation. 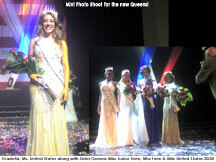 After the big win, Graziella has a mini- photo shoot with her sister Queens, and around the Orleans Hotel. 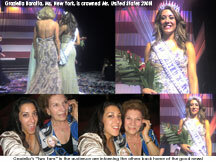 Graziella Baratta, (Ms. New York) is crowned Ms. United States 2008 on July 17, 2008 at the Orleans Casino Hotel in Las Vegas, Nevada! After some more rehearsals, the Games began! 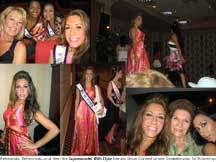 Today, the official Ms. United States competition began with Personal Interviews. After hours of rehearsal for the national pageant, the girls kicked off their competition spirit in the "Supermodel With Style" Fashion Show Contest. Graziella won 1st runner up in her division for Supermodel With Style! All the United States contestants wore red outfits to support the American Heart Association's Go Red Campaign, and traveled to the Fremont Experience in the heart of Las Vegas to greet fans. 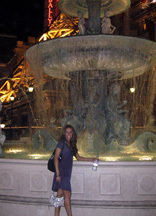 Graziella arrives at the Orleans Casino/ Hotel in Las Vegas, Nevada to compete in the Ms. United States Pageant 2008, as Ms. New York 2008.